After reading David Lebovitz’s scoop-endous list of blogs that feature recipes from his book, The Perfect Scoop: Ice Creams, Sorbets, Granitas, and Sweet Accompaniments, I decided I had to order a copy for myself. It arrived in the mail last week and I eagerly flipped through 246 pages of fantastic recipes and photos. The book has great information about equipment and technique in addition to the extensive assortment of recipes that go well beyond frozen treats. These additions include recipes for toffee, candies fruits, ice cream cones and more; all sorts of things you would expect to accompany your ice cream dessert at a nice restaurant. If you don’t have a book on ice creams—or if you already have more than 10—I highly recommend this one. Great job, David! If you are in the San Francisco bay area and would like to meet David in person, tickets are still available for his class/demo on June 22 at Draeger’s Cooking School. I’ll be there, too, of course. If you reside elsewhere, check out David’s schedule for an appearance near you. I’m looking forward to seeing him make parsley ice cream (recipe also in The Perfect Scoop), since I wouldn’t have the balls to make an ice cream with parsley on my own. 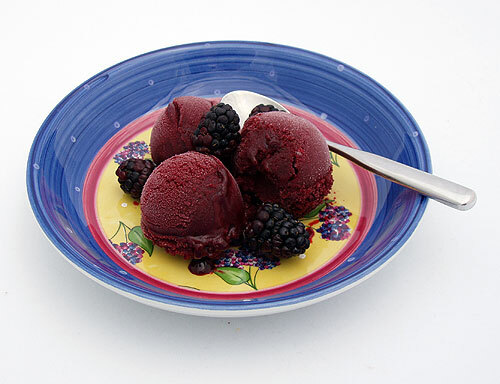 The first recipe I made from David’s book was Blackberry Sorbet (open your books to page 126, please). 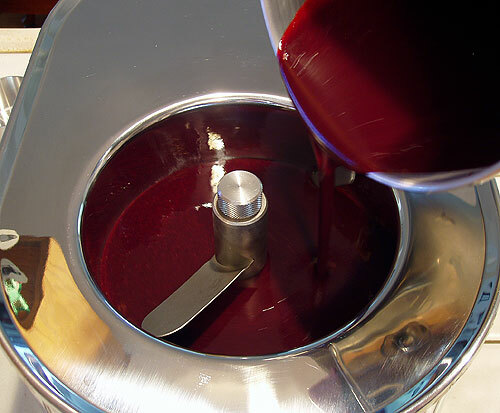 I love berries and any ice cream that I get to use my chinois is even better. 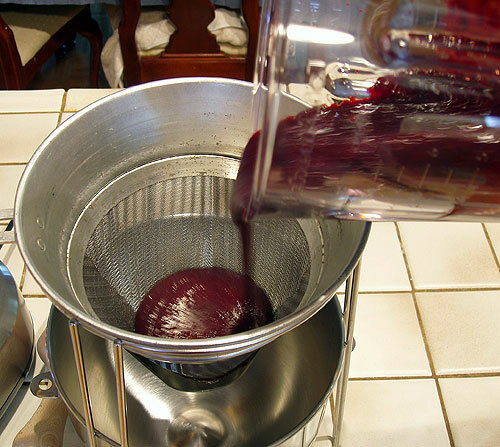 Coaxing the blackberry puree through the chinois was more work than it was with raspberries, which surprised me. 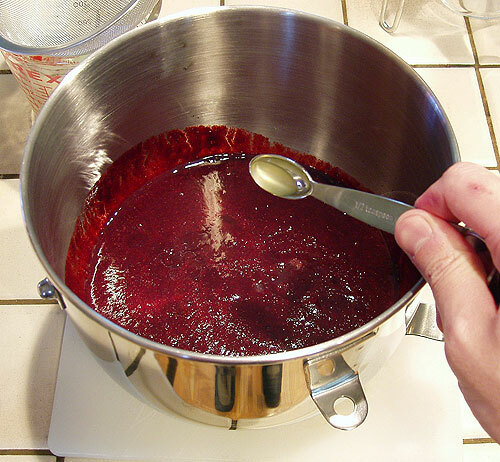 Like the raspberry sorbet I make, I ended up with a heaping 1/4 cup of seeds, so don’t skip using a sieve, strainer or chinois. Since this is a no cook recipe and the amount of lemon juice required is small, it actually assembles very quickly. 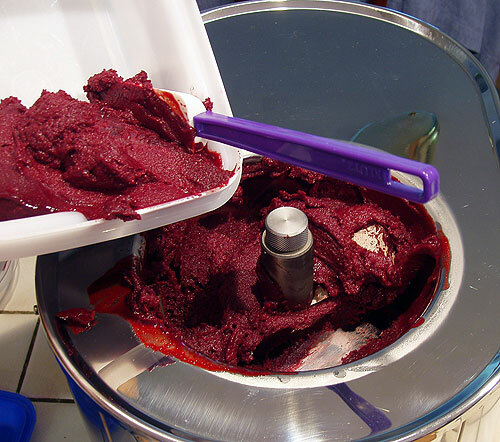 The finished sorbet recipe has a beautiful, deep red hue and tastes as good as it looks. I added a little Chambord and limoncello to the recipe since I am hooked on alcohol in sorbets. The resulting flavor is deliciously intense so I considered other flavors to pair it with. Realizing that this sorbet was a key ingredient in my current favorite flavor of Ben & Jerry’s sorbet, Berried Treasure, I decided I would make David’s recipe for lemon sorbet for my next post. 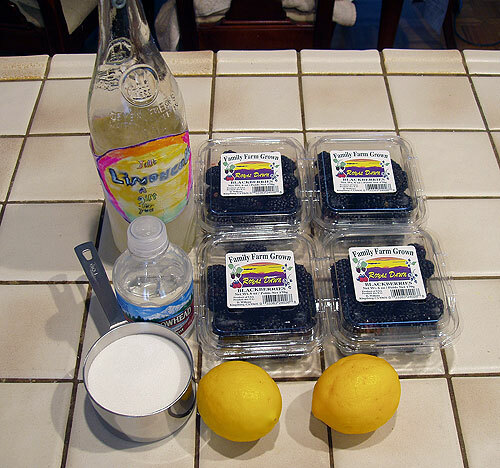 Ingredients for making Blackberry Sorbet. 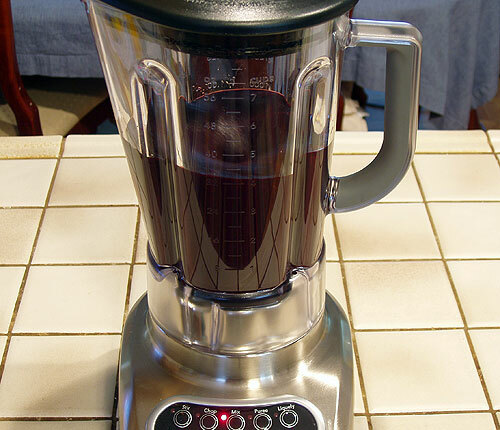 Purée sugar, water and blackberries in blender. Pour purée into sieve, strainer or chinois to remove seeds. Add lemon juice, Chambord and limoncello and transfer to ice batch to chill. Once sorbet base is colder than 45° F, freeze in ice cream maker per your maker’s instructions. Transfer frozen sorbet to dedicated container to ripen in freezer for several hours. 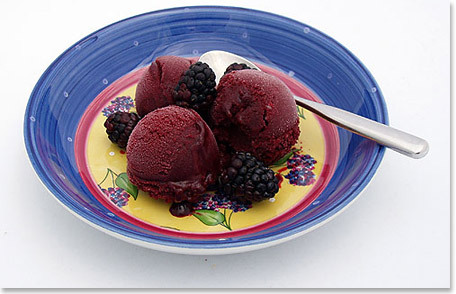 The recipe pictured above, with detailed instructions and complete photo gallery, can be found on the Blackberry Sorbet recipe page. This entry was posted on Thursday, May 31st, 2007 at 2:11 pm	and is filed under Sorbets. You can follow any responses to this entry through the RSS 2.0 feed. You can leave a response, or trackback from your own site. That is the most gorgeous color!! It looks unbelievable. This is the third time in two days that I heard someone rave about David’s book. It think it is now a must on my buy list. It stains everything, so you have to be careful, but berry sorbets are just gorgeous in color. The Perfect Scoop is a very thorough cookbook and David has little anecdotes peppered througout so you get the Lebovitz feel. Fantastic that you use a chinois! I remember making tomato soup with my grandmother using her chinois. Unfortunately, hers was lost to a flood in the Ohio River valley, and I’m still looking for one for myself. Hi Miss Charlotte, Williams Sonoma has a chinois set like the one I use here, but I’m not sure what your choices are in Germany. Otherwise most of the ones I see, like on Amazon, are more like a fine collander (some call them china hats). My chinois has a sweet tooth and is used primarily for ice creams, gelatos and sorbets. Brian, it was great to meet you on Sunday. Thanks for making it! I love the blog!!! Looks wonderful, Brian. Must get the book. Hope the camera a success! Hi Sam, I think blackberries are one of those fruits that vary in sweetness enough that adjusting sugar may be in order. The alcohol in the recipe may help offset some of that, did you add any? I also paired this with the lemon sorbet from David’s book, which make an awesome pair, so the sweetness may have been balanced out by the lemon in this case. That’s a great tip about the muslin. Where do you buy it from? You can get muslin cloth from Walmart / publix (grocery store)… It is thicker than a cheese cloth. 🙂 If you don’t have any walmart nearby, you can try any textile store. Yes, I did add the alcohol (limoncello). Thanks for the tip.